This is where I write down my thoughts, talk about what we are doing in the garden and what we make with the produce. I've come a long way since April 2016, not wanting to blow my own trumpet but I think I have achieved quite a bit considering. The latest in my long list of things I must try happened just this afternoon. We have had my sister staying with her kids and whilst here said made use of our bath. Now I've not used it since before April 2016 but it got me thinking about trying to get in. And then of course trying to get out. First hurdle was getting in the bathroom, there is a huge step up into it. It was quite easy really, put the wheelchair up to the step and then went off the front of the chair and onto my knees and then across the bathroom floor. Then it was a case of pushing up onto a stool getting undressed and then into the water, easy when you say it quickly. Getting out was just as straight forward. A trick I have learnt is to not over think how you are going to do something and just crack on. That's how I get my best results! The gardening season has come to a bit of a close, there are still jobs to be done outside but the weather is not as favorable, so already we are looking forward to next spring when we can get planting again. With winter approaching I have to find other things to keep me occupied, keeping fit is one of them. And this was another milestone! 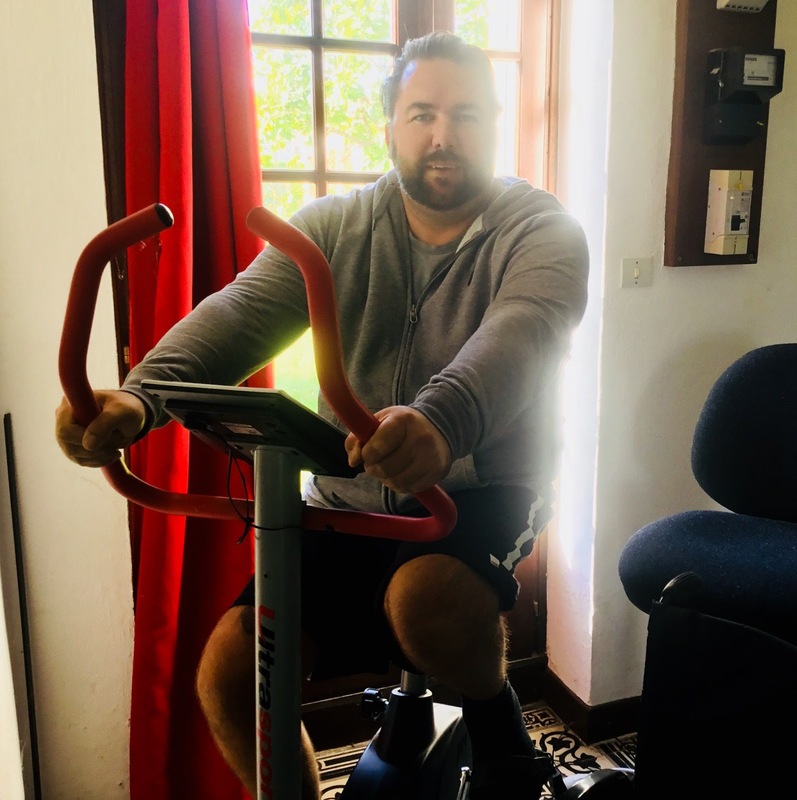 I had been thinking about getting on the exercise bike for a while but wasn't sure how to do it. Then one day I thought I could get onto my office swivel chair which goes quite high on the hydraulics and then slide over onto the bike. Tried it and it worked. Managed ten minutes first try, it was pretty hard work but the more I got on it the easier it became. I've built up to twelve minutes pushing through 4km. The aim is to get my legs strong enough to be able to walk ultimately but if that doesn't happen then at least they will be strong enough to power a recumbent trike and I can follow Tina up the road when she walks the dogs, a bit more freedom and independence. 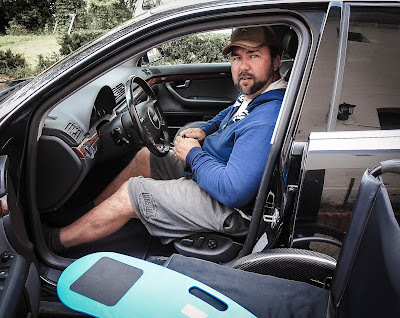 Another milestone was getting into the car and being able to drive, I have enough movement and strength in my legs to be able to operate an automatic. It may seem fairly normal to most people but when you can't do something that before you took for granted it can get a bit frustrating. I'm not sure whats in store next for me, but I seem to be progressing all the time. I can now get on all fours and crawl across the floor like a baby, before I couldn't balance enough to be able to move. Now it seems fairly easy. Next month I have some appointments at the hospital, one is for a scan on my heart. I guess that's to check if the new plumbing is still working and attached as it should be. Then I have an appointment with a Dr that specialises in rehabilitation and then I'm going back to see my Dr in the rehab centre to see what he says, the last visit didn't go well as he was nearly two hours late and when he finally did see me just said "no I don't think you will walk again" hence the reason we are trying to do as much as we can at home to prove them wrong. At the end of the day, no matter what situation you find yourself in. Don't give up! Its easy to say and not so easy to do but keep pushing what you think you can do and what you can't and you might be surprised. Keep up to date with progress and anything else we do on the urban farm here www.theparaplegicgardener.com where you will find our blogs and YouTube channel . Stuffed Chicken, wrapped in Bacon. Here's a different take on the good old chicken breast. Why not open it up, stuff it and then wrap it in Bacon. Sound like a good idea? Trust me, they are lovely. As with any of these recipes that calls for you to stuff something. The world is your Oyster! Only your imagination limits what you can put in there. Tina is a dab hand at making these and this last time she made them I asked her to put a Scotch Bonnet chilli in mine, that gave it some serious heat! This recipe will feed two, if you need more you can just adjust the ingredients to suit. Raclette cheese, you can use cream cheese or any other cheese. Method/ How Tina does it. Open up the chicken breast, scoring the side of it with a knife to flatten it out. Put the cheese and optional chilli on top of the chicken breast. Then roll it so the filling is inside. How to make Fresh Red Chilli Pickle. First up you need to cut up the chillis, I cut them in half and then slit them along the length. I also left the seeds in as we quite like the extra heat. Now put the chillis into a bowl and cover them with the salt, this will draw out any moisture in the chillis. Leave them sat in the salt for an hour minimum, longer would be better. Ideal tools if your old, disabled or able. This is going to be a review, I was going to aim it at the elderly and disabled. But in fact it's going to apply to everyone. No one is left out here, it caters for all. I had never given it much thought before, when I was young fit and able bodied. But now I am on wheels these things do crop up, and when it comes to gardening the tools you use do come into it. When I first got home after eight months in Hospital I decided that I would try to do what I could in the garden, within reason! I could get onto the John Deere tractor to cut the grass (we have since sold it) but when it came to the flower and vegetable beds the tools we had were either too long for me as I was now sat down or the Hand tools were too short for me to reach the beds. So this brings us to Wolf Tools (Wolf Garten). This is a range of tools with interchangeable heads and lots of handle options.